Here's the most heavy-duty, durable pipe available. It comes to you in 304 or 316-alloy stainless steel. This extra tough pipe consists of four interlocked layters, each is .018" thick. 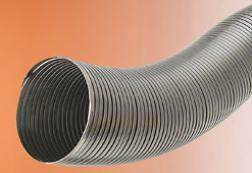 This design gives the pipe maximum strength and flexibility (26" and 32" bending radius for 6" and 8" diameters). Relining with HomeSaver RoundFlex makes going around flue offsets easy work. And, with oval and rectangular configurations, you can pass through dampers without downsizing. HomeSaver offers the best warranty for woodburning and wood pellet applications in the industry. This outstanding lifetime warranty covers not just workmanshyip and materials but damage from chimney fires as well as other possible misuses. The 304-alloy has a lifetime warranty for woodburning and is available in 3" - 16" diameters. RoundFlex diameters of 3" - 12" UL Listed for wood, coal, oil, and non-condensing gas when installed according to the manufacturers instructions. Fits 10 inch inside diameter chimney.